Wondershot is a fun little arena game with some very cool mechanics hidden away in primarily couch co-op game. When we first got our hands on Wondershot while I was back at FBF Towers we immediately jumped onto the multiplayer, skipping the tutorial and diving nose-first into an opportunity to smash each other to crumbs in a lovely, brightly coloured game. It was really good fun, but I wish we’d not so rashly rushed. For one, unlike the others, I was on the keyboard which has really quirky controls – J for attack, a dodge button somewhere, and the shift button claps the winner (or activates sticky-keys). For two, and most importantly, it meant it was an experience of panicked luck, skill hardly came into it. I adore the loading screens. 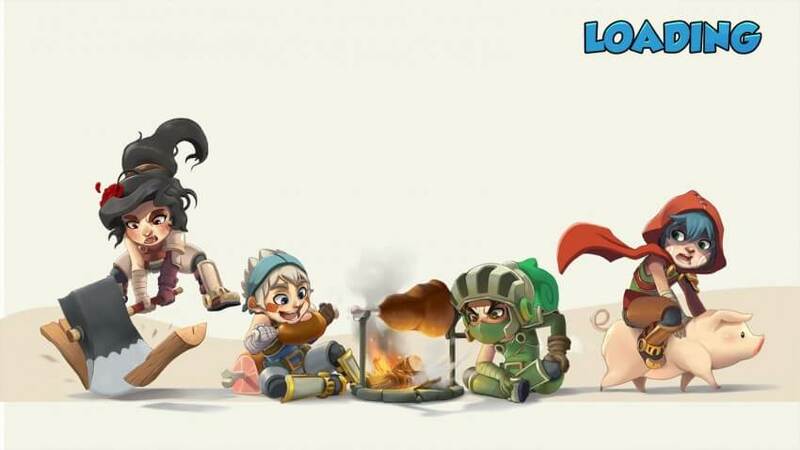 The art style is fantastic and depicts the light-hearted nature of the game perfectly. Wondershot is on the surface an extremely simple, and light game. Underneath that brightly coloured surface however is a game which functions best when it is played with skill, tact and timing. Each of the games four weapons have different attacks, and while four might not seem like a lot – there is a massive amount that can be done with them. 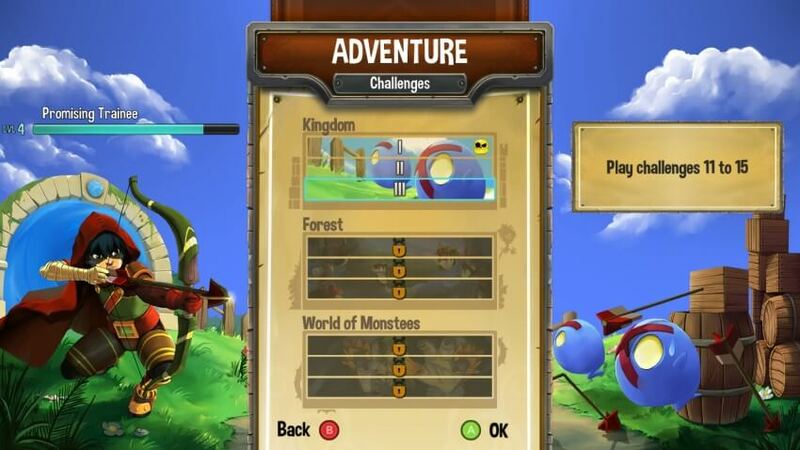 The game features a single-player challenge mode, one which you might well not be aware of due to the large focus on the multiplayer fun which can be had. This challenge mode starts simple, however before long it becomes a tense, harsh climb that requires you to perfect each of the weapons, and their uses. Early missions might simply focus on the fact that a quickly fired arrow will home in towards the enemy, and slower presses will result in a rapid, piercing blow – but the later equivalents hinge on you make the decision between the two in milliseconds, not missing (as the weapon doesn’t return to you except on a confirmed kill), and also firing those arrows through portals to hit enemies out of your normal reach. It’s hard, but it’s so quick, and pure, that it remains fun even at it’s most frustrating. The bow and arrow’s adeptness is useful, but the slingshot’s ball will change size and speed based on the time the fire button is held, and it’ll also reflect off of panels, allowing you to shoot around corners – it’ll bounce up to three times. The hammer’s standard attack sees it thrown forward a small distance, it’s longer-press attack, however, will throw you forward – taking you past obstacles, or even enemies. Finally, the boomerang will return to you on a weaker press, but a prolonged press will hold it, levitating in place, as you release that button it will make a bee-line back to you, and if there’s an enemy between you then they are dead. Phew. Another consideration, if you fail to connect your hit then you lose the weapon, and all of a sudden you are unarmed – your boomerang or arrow lodged in a wall, your sling’s shot tossed aside, your hammer lodged in the ground. And, if you’re playing multiplayer then those weapons are your enemy’s for the taking. As if these combinations aren’t enough for a fast-paced arena multiplayer, there’s also power-ups: A supershot will fire through obstacles, a super speed will rocket you away from enemies, and there’s a final one which allows you to ghost around the map through obstacles. If you’re not in the mood for facing off against your buddies, or the 45 challenges that the game features then there’s also a wave defense against the game’s AI enemies – a mixture of creatures which cover most of the classic categories: chargers, ranged, melee, and mages. All of this while the levels start to feature more obstacles, like slowing mud, swirling sandpits, and more. There’s a surprising amount of content in the game, considering most people’s first impressions are that it’s simply a couch multiplayer – and while the wave defense, or even the challenge mode, on their own don’t give a particularly large amount of content, when all of the modes and potential challenging play with skilled players are rolled together then Wondershot is certainly worth the current entry price.